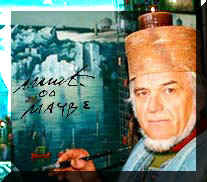 One of the most striking and most interesting personalities in the Serbian art. Born in 1934 in Belotic, Serbia. He graduated from the Academy of Fine Arts in 1959 and went to Paris as an awarded graduate. In September the 1st 1959 he held his first one-man show in Belgrade. Since 1964 when the second one-man show was held in Geneva, he is present all over the world. From 1964 to 1965 he lives and works in Paris, than in Belgrade, Brussels, Belotic, Zlatibor, Pyrrhus /Greece/, etc. Apart from the National Museum and Museum of Modern Art in Belgrade, his paintings are displayed at the Uffizi Gallery, Florence, The Vatican Museum, Rome, the Guggenheim Museum, New York and the Historical-Fine Arts Museum in Geneva. Of his sculptural works he has done the composition “Greek Mother and Serbian Mother” for Corfu, and he is preparing the monument in front of the Radovan tower, “Mother Jevrosima and Damjan’s darling” in Krusevac. He is also preparing a monument “Liberation of Leskovac”. Milich has also written four books of poems, preparing the fifth book “Barbarians came nevertheless”. He became a member of the Serbian Association of writers in 1992, member of the artistic group and movement “Mediala” in 1954, member of the World Association “Fantasmagie” in 1958. Hi is a publisher as well, helping the other gifted poets.